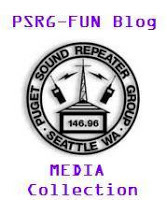 Below is a list of DTMF codes for use with the PSRG repeater. To make an AllStar connection use: *3<node number>, to disconnect: *1<node number>. Similar to IRLP, Echolink connections are made by using *33<node> and disconnected with *13<node>. Also, short Echolink numbers like 9999 and 93225 need to be padded out to 6 digits by adding leading 0’s. Node 9999 needs to be entered as 009999 and 93225 needs to be entered as 093225. Besides Echolink/IRLP/AllStar we have installed features for the members to use. This includes a feature that plays back your recorded audio so one can check their audio quality and signal. Key up, say “[your call] controlling” then enter digits *55 from your keypad and un-key. The repeater will say “Ready.” then key up and give a short transmission. After you un-key the repeater will play back the received audio. See more on the Wiki. There will be many questions about the system and we encourage members to check out the Web sites below. There you’ll find the node numbers of the Cities and Countries and other operational procedures. And remember to pause between transmissions.